Let Master Plumbing help you choose the perfect hot water heater for your Chevy Chase home! Your hot water heater is one of the most heavily used appliances in your home, and with all of the options available you will want to choose the one that works best for your Chevy Chase home. Master Plumbing is here to help you with that decision. Have you ever tried to run the dishwasher and take a shower at the same time, only to have a very cold surprise in the shower? Your Chevy Chase indirect hot water heater would make this problem a thing of the past. These units are capable of producing over 100 gallons per hour. Typical conventional gas models only produce about 33, and typical electric models around 20. That is a lot of hot water for your Chevy Chase home! Chevy Chase homeowners are always looking for ways to lower energy bills, and installing an indirect hot water heater is a great way to do that. Typically, an indirect hot water heater costs around 50% less that most electrical models to run. Since the coil runs around the boarders of the tank, they help prevent loss of heat during standby times. 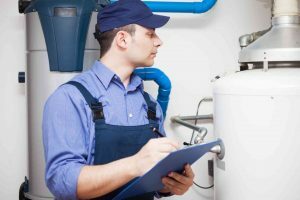 A hot water heater is not an inexpensive thing to replace, so you will want to make sure that your Chevy Chase hot water heater lasts as long as possible. Since indirect hot water heaters don’t have any electrical components, there’s nothing to burn out. Indirect hot water heaters are also crafted with high quality stainless steel, so there is less possibility of rusting. The type of water heater you need will depend on the size of your Chevy Chase home and the type of fuel source available.